Welcome! to the Power of Proof newsletter from Surety! Here you will read about latest news in scientific intellectual property protection, along with specific Surety initiatives addressing current IP protection trends, concerns and technology advances to better protect and legally defend your organization's most critical electronic research and lab data. We welcome feedback about the content provided at info@surety.com. 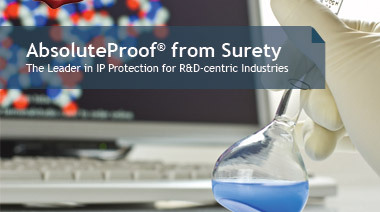 New AbsoluteProof WebMovie: Take a look at our new 3.5 minute product overview webmovie, “Data Integrity and Intellectual Property Protection.” You’ll get a full sense of how Surety’s AbsoluteProof intellectual property protection solutions work, and the value they deliver to the Biosciences R&D industry. Everyone wants a piece of the Facebook pie, including one man who claims to have emails that prove his entitlement to fifty perfect of the company's equity. We'll be at this year's BIO International Convention, within the Northern Virginia Life Sciences Pavilion. Stop by and see us. Summary: While former PruchasePro executive Charles Johnson is currently on trial in U.S. District Court on charges of making improper deals to inflate company earnings, he is staying in the headlines for an earlier case that ended in a mistrial and led to the firing of Johnson's former attorney, Preston Burton.